Discover a lesser-known region of Morocco on this guided, 5-day outdoor adventure to the Middle Atlas Mountains from Marrakech. 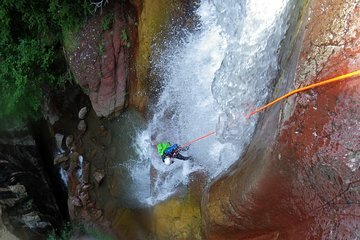 Try abseiling, aquatic trekking and canyoning near the Ouzoud waterfalls by the Grand Atlas village of Tanaghmeilt. Follow the shaded path of olive trees to one of the most popular sites near Morocco — a breathtaking display of natural beauty. Also, visit Bin El Ouidane Lake, the La Cathèdral rock formation in the Ahansal Valley and much more. This small-group tour includes most meals plus accommodations and transportation.